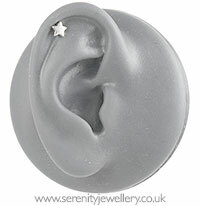 5mm sterling silver star design on a 316L surgical steel 6mm or 8mm bar with 3mm screw-on ball closure secured at the back of the ear. I bought this to wear on my tragus piercing but the star itself is quite chunky, so instead i wore it on my helix and suits the area much better. matches well with the double star i also bought. The star itself is a little bit thicker than I was expecting it to be, but it's a really great quality piece of jewellery. The screw on the back is gentle enough that it doesn't irritate my ears when I put it in, the back threads on really easily and securely, and it just sits really nicely against my ear. Would definitely recommend. The star is very pretty, and the bar is of high quality. However, I have small ears so the star looks a little bit to big for my ear (not the company's fault I should have read the sizing of it) if I put it on my upper helix piercing, but in lobes it looks fine. Many thanks for the quick delivery!!! This perfect both the appearance and the fitting. Good buy and would go for it again. 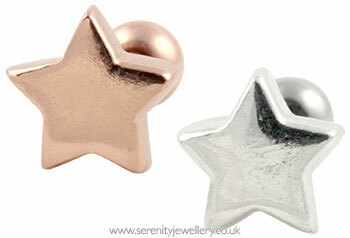 Lovely shiny star, very comfortable to wear and no allergic reactions, perfect. This is a really cute little stud for my helix. I like that the star is bright silver and not titanium as it looks like my other earrings in that ear.